Sometimes in life you get what you deserve. Unless you have been living a hermit's existence just lately you'll be aware that certain people have been doing their best to claim that the product being served up in F1 right now is unspeakable, and in so doing crying about the sport and the fans when for much of their time associated with F1 they haven't given much impression of caring a great deal about either. In the hours before the Bahrain race Bernie Ecclestone called the 2014-spec offering 'unacceptable'; Ferrari's Luca Montezemolo reiterated his view that it is a 'taxi driver' formula; and this followed on from Red Bull's big beast Dietrich Mateschitz threatening to walk away in disgust at it all. Yet in an hour and 38 minutes of circulating at the Sakhir circuit the great folly of such views - and the self-serving nature of them - were laid bare. Deserved, as I said. What we had today in Bahrain was the grandest Grand Prix of the season so far; indeed the grandest in a good while. And unlike a few previous memorable ones it didn't rely on gumball tyres, a rain shower, or another (dare I say slightly false) variable to spice things up. Desperate battling up and down the field was witnessed throughout on a track that whatever its limitations does contain plenty of overtaking opportunities. By the end of it all you were almost relieved, in that it allowed you finally to get your breath back. That Fernando Alonso punched the air upon crossing the line having achieved only a lowly ninth place seemed highly apt. Lewis Hamilton triumphed just like last week, but many of the similarities with his Malaysian race end there. This time Lewis really had to fight for it - and for much of the way - against a potent team mate. Lewis sneaked ahead of said stable mate and pole sitter Nico Rosberg at turn one, but in the opening stint it remained close, indeed Nico twice dived up the inside of Lewis at turn one to lead briefly but neither time made it stick. On the latter occasion it took Lewis all the way to turn six to get the place back. This looked serious. Then someone at Merc split the ticket, with Lewis peeling into the pits to bolt on new soft tyres while Nico pressed on for a couple of laps before moving instead onto slower mediums. 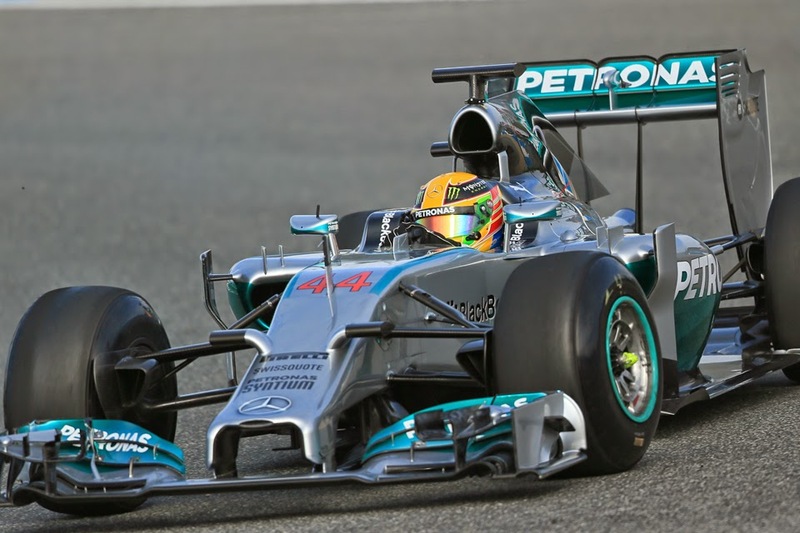 Lewis therefore edged clear, and built incrementally close to a ten-second gap on his team mate. Even though he would later have the pain of the mediums himself it looked a decisive advantage. But then... Pastor Maldonado flipped Esteban Gutierrez's Sauber at turn one, thus heralding a lengthy safety car period. This wiped Lewis's advantage from the timing screens, and worse left him with mediums with Nico right behind on the faster softs. Reportedly Lewis's side of the garage at this point thought they were sitting ducks, and indeed when racing resumed Nico did his darnedest to get ahead. It was a lot like a repeat of the first stint, with Nico and Lewis again frequently sparring in wheel-to-wheel combat. Again twice Nico dived up the inside of Lewis into turn one; twice again Lewis took the place back, and similar to before on one occasion the battle continued almost to turn six. It was a desperate and topsy-turvey battle for the win, the like of which we hadn't seen in a good while. But Lewis kept his head, tending to keep his car just enough out of Nico's reach, including with rapid final sectors of the lap. And then in the final three tours the flip-side of Nico being on the softs was felt, as the rubber rather lost its finer edge. Lewis was therefore set fair for the win. 'Winning the race is the greatest thing, you are happy, but deep down inside I didn't have the pace today, so we have to learn and find out why that was. A lot of the advantages I had in the last race, Nico found them when we came here. 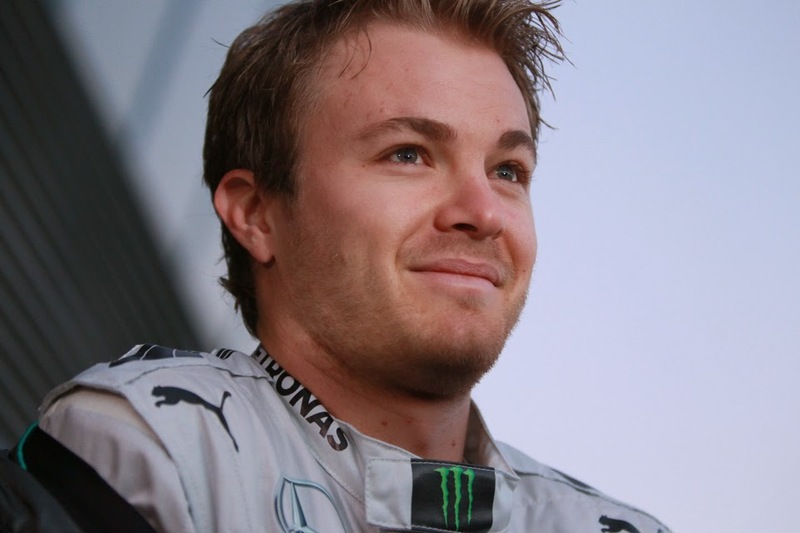 Nico too - both from his demeanour and his words - seemed to view this as one that got away: 'It was really aggressive, putting everything to the limit, and it was so close, and so many times I thought "now I've got him" (Hamilton) and he just came back at me. He did well.' He then added: 'I was very quick today, the quickest car out there...the next race is going to be my win'. Perhaps in the cold light of day too he'll remember that after the goings-on in Malaysia a week ago this at the broadest level was an important bounce back for him. Niki Lauda after the chequered flag fell meanwhile - possibly thinking of the machinations of Bernie et al - summed up the views of a few: 'If anyone complains that this is boring then they're an idiot'. Amen, Niki. The Mercs were clearly the fastest things out there, but fortunately for us watching on the matter seems much more Senna/Prost in 1988 than Fangio/Moss in 1955. Any fears that the two of them would be forbidden from racing each other were blown apart today. And it's just as well, as in among it all we got confirmation of just how much quicker than the rest the silver cars are. After the late safety car there were eleven laps of racing remaining, by the end - and despite some furious dicing - the best non-Merc (as in the chassis) was 22.9 seconds off the lead. That's upwards of two seconds a lap in other words. Good luck to anyone planning on clawing that back. You'll most likely need it. Today we further got galling demonstration of the clip of the Mercedes power unit, as those so equipped were best of the rest persistently. Indeed, early in the race the whole of the top seven had German power. The Force Indias were for the most part next up, like the works team adopting a two-stop strategy, and of the two Sergio Perez just as in qualifying looked in the best form. Despite fear that the safety car would spoil their day and leave the two cars vulnerable to the Bulls, Checo out galloped them nevertheless to finish third. Astonishingly too, it was only the second podium finish ever for the Force India team. It was the sort of podium run that typifies Perez at his best, all crisp aggression and assured pace. As is often the way with him though the next question to be answered is whether he can do this sort of thing consistently. Nico Hulkenberg meanwhile sounded a bit frustrated on the way to fifth. Williams ran among the Force Indias for a lot of the way, though planned one more stop, a strategy that would have been punished more without the safety car intervention. In the end Felipe Massa finished seventh and Valtteri Bottas eighth in the final shake out. For the third time out of three this year it felt a little like the FW36's potential wasn't being converted into the results that it should. While McLaren got the lanterne rouge of the Merc class; Kevin Magnussen weirdly off it all weekend and indeed being the one Merc runner not in the battle at the front. Jenson Button at least got into the mix, but neither made it to the end thanks to technical woes. Button insisted that the car had the potential to be the best behind the Mercedes today. It was an especially traumatic day for Ferrari, who appeared to be losing metres to its rivals on the straights of which there are plenty at this track. This on a day too that the big boss was making one of his rare appearances (and the TV wold feed cut to him on occasion, sporting a face that could stop a clock). The red cars could only take the crumbs that fell from the top table, with ninth and tenth places their reward, Alonso ahead as mentioned. And to think that the reset of the new rules for this year was supposed to suit the Scuderia. That the German marque Mercedes has taken the same set of regs at the same time with in all probability less budget and clean jumped over the Ferraris will be hard to swallow down Maranello way. And as Jackie Stewart used to say, at the best of times it's not a place for the feint of heart. Such is the Mercs' advantage however those two cars could probably start in another postcode to the rest and still end races on top right now. Plenty of head-scratching will be going on among its rivals, and a small crumb of comfort is that they now only face one race in the next five weeks. But you feel that won't be nearly enough time to alleviate matters. Not fully anyway. Yet today - and despite this single-car dominance - we received plenty of assurance that F1 in 2014 will not be dull. "Yet in an hour and 38 minutes of circulating at the Sakhir circuit the great folly of such views - and the self-serving nature of them - were laid bare. Deserved, as I said." This was a truly exciting race with fantastic driving by just about everyone. I just hope F1 doesn't go crazy and penalize too many drivers which would cause future races to be mundane and boring.